Artichokes can be intimidating. Diving into those prickly leaves can lead to poked fingers and plenty of frustration. But when you bother to take that dive you are rewarded with a very nutty, lightly tannic, utterly delicious result. I show you how to buy, store, trim, and cook artichokes below so you can turn those thorny delights of spring (and, to a lesser degree, fall) into tasty treats. Most of the commercial artichoke crop in the U.S. is grown in California where the main artichoke harvest happens every spring (March through June). A second, smaller crop grows for a fall harvest. Look for artichokes with closed heads - the leaves should form tight, compact layers. The whole artichoke should be firm and feel heavy for its size. The stem will be brown if it was cut more than a few hours ago, but it shouldn't feel either slimy or dry. Keep artichokes loosely wrapped in plastic in the fridge. Fresh artichokes will last up to a week, but like all veggies are best the sooner after harvest they are used. 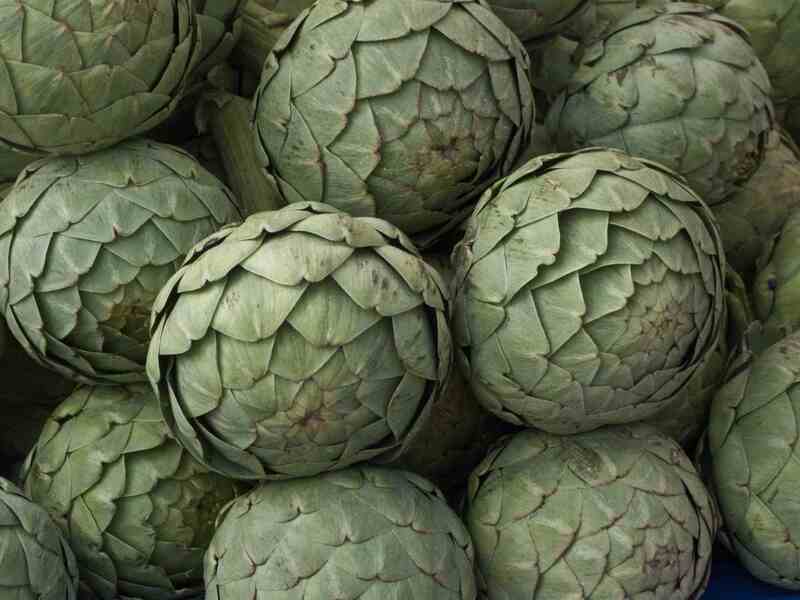 Artichokes are famously thorny – how hungry must the first person to eat an artichoke have been, goes the joke. Yet those thorns are quite easily tamed. Careful eaters can simply use caution. The rest of us can snip the thorns off the leaves before proceeding. To get to the heart, that meaty center of the artichoke that makes those thorns worth fighting through, you need to properly remove the outer leaves. Baby artichokes are artichokes that actually grow smaller, they aren't simply small or immature versions of larger artichokes. The "choke" – the hairy layer over the heart – isn't nearly as developed as in larger artichokes and is usually fully edible. This makes preparing baby artichokes much easier, per artichoke anyway, than large specimens. The easiest and more classic way to cook artichokes is by steaming them. Set cleaned/trimmed artichokes in 1/2-inch of salted water with a squeeze or two of lemon juice in it. Bring to a boil, cover, reduce heat to a simmer, and cook until you can easily pull a leaf from the artichoke. (You can also steam artichokes in a microwave.) Let cool a bit and serve warm with melted butter or let cool a lot and serve with mayonnaise or aioli (find great dips for steamed artichokes). Find more ways to cook artichokes, as well as fabulous artichoke recipes. Baby artichokes are both easier – no need to worry about the choke – and more of a pain – you need more of them to serve the same number of people – than larger artichokes are.